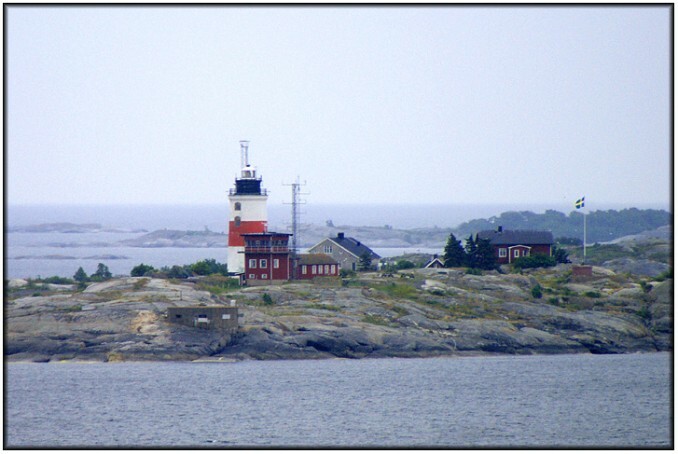 This fairly elaborate lighthouse station is located on the small island of Torskär at the most northerly point of the Söderarm Archipelago. It originally marked the start of the approach to Sotckholm for westbound and southbound vessels. The light dates from 1839 and was originally fueld by colza oil, an oil produced from the plant Brassica campestris also known as Swedish turnip. This oil was very much cheaper than whale oil that was commonly used at that time to fuel lighthouse lamps. This lamp was replaced by a kerosene lamp in 1882 but the original reflecting mirrors remained in use until 1928 when a third order Fresnel lens was installed and the light was replaced by a Gustaf Daléns AGA light. The light was electrified in 1953 when automation was also introduced. Although automated, the station continued to be manned until September 1997 when the staff were withdrawn. In 1999 the light was replaced by an aerobeacon mounted on a metal mast (which I presume is the mast visible on top of the tower in this photo rather than the mast immediately to the right of the tower which appears to be a communications mast). The mast was removed in 2009 the year after these photos were taken. A conference company now promotes activities on the island and overnight accommodation is available in the keepers' house. 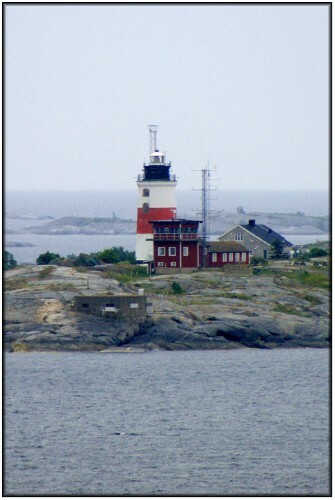 The image below shows a wider view of the light station with some of the other ancillary buldings visible.